There was an explosion, some crystals, a lot of lava, and several nuclear warheads. Plus, a crazy time-traveling dinosaur. 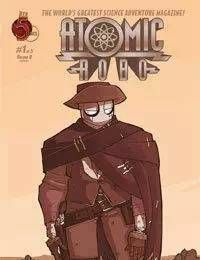 Now its 1884 and Atomic Robo is up against the notorious Butcher Boys. The fate of the West is at stake, but can Atomic Robo save the day before his nuclear fuel runs dry?